IOWA CITY, Iowa (Sept. 20, 2018) — A review of shoulder injury cases from 2017 provides a startling glimpse into the impact of changes to Iowa’s workers’ compensation system, indicating that workers who suffer serious shoulder injuries will on average lose out on $72,000 in compensation under the new law. The workers’ compensation changes, along with significant reductions in public employee bargaining rights and repeal of local minimum wage laws, were among noteworthy blows to working families from the 2017 session of the Iowa Legislature. The new report from Glasson, Labor Center research assistant Emily Schott and UI history professor Colin Gordon, senior research consultant at IPP, examines impacts of the workers’ compensation law changes. The report is available at www.iowapolicyproject.org. 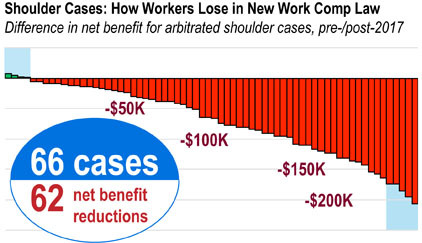 The new report illustrates the impact on workers by analyzing shoulder cases already decided in 2017, compensation awarded in those cases, and then recalculating compensation that would be awarded under the new rules. Her research found that of 322 cases decided by administrative law judges at the Division of Workers’ Compensation during 2017, 87 involved shoulder injuries. Of those, 66 workers were awarded permanent disability benefits that could be compared under the old and new laws. And of those, all but four would have received less compensation — and in many cases dramatically less — under the new law. Gordon looked at the individual impacts on workers, showing a wide range of benefit changes. In one case, the beneficiary would have received $206,000 less under the changes. In seven other cases, the loss would have exceeded $150,000. The researchers noted that the vast majority of workers’ compensation cases are settled before reaching a judge, so these 66 cases represent just a small subset of the total number of workers who suffer similar injuries in Iowa each year who can expect much lower compensation under the new law. “We do know that there are likely hundreds of serious shoulder injuries in Iowa every year. All of those people will be affected in a similar way, going forward,” Glasson said. “The only constant among all the many changes in this law is that they are bad for workers. Probably the most significant impact will be on workers who have serious, permanent disabilities,” he said. The Iowa Policy Project is a nonpartisan, nonprofit public policy research organization in Iowa City. Reports are available at www.iowapolicyproject.org.